Brightness controller 1.3.1 is ready for download. GET IT HERE while it's hot off the compiler. This version adds support for yet another display. 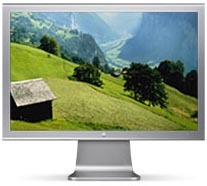 This time it is the 20" Apple Cinema Display with aluminum frame from 2004. There are also a lot of behind the scenes changes in the code that should allow for easy addition of new display types. - Added support for 20" Cinema Display with aluminum frame. - Merged brightness control logic for all displays. - Smoother brightness change when keeping shortcut buttons pressed.